"Euro Milhoes - The Biggest European Lottery - From Portugal"
For all Global Lottery Review readers in Portugal – we would like to include a section here on the Euro Milhoes – EuroMilhoes – lottery. If you come from Portugal you will be well aware that the EuroMilhoes is exactly the same European Lottery game as the Euro Millions – in certain countries the highly popular Euro Lotto is known by a different name – and this is the name it is sold under from the Portugal Lottery. If you do are not Portuguese you may not have known that the EuroMillions Lottery is called EuroMilhoes within Portugal itself and the fact that the Euro Millions lottery is also known by another different name in Spain – EuroMillones – or Euro Millones. The main thing to remember is that each of these names relates to exactly the same game – the highly popular European Lottery – EuroMillions. The EuroMilhoes in Portugal is provided by the organisers of the main Portugal Lottery games – Jogos Santa Casa. Jogos Santa Casa administers all of the primary Lottery Portugal offerings and they have numerous popular lottery – or lotaria – games in their portfolio. In addition to the EuroMilhoes itself – there is the main Portugal Lotto game – the Toto Loto – also known as the TotoLoto or Toto Lotto – the Toto Bola, the Lotaria Classica, Lotaria Popular, the Loto 2 and Instantanea (Instant Lotteries). The EuroMilhoes is 1 of just 3 multi-national European lottery games – the others being the Viking Lotto from Scandinavia and the more recently launched EuroJackpot. The Euro Milhoes began in 2004 with just the UK National Lottery, Spanish Lotto and France Lottery – Francaise des Jeux – taking part. The first Euro Milhoes draw was on February 13th 2004 and took place in Paris. Later that same year in October 2004 – 6 more national lotteries joined in offering the EuroMilhoes as part of their lottery portfolio – these were the Austrian Lotto, Loteria Nationale from Belgium, the Irish Lottery, lottery.lu – Luxembourg – Jogos Santa Casa from Portugal and the Switzerland Lottery – Loterie Romande. Since the beginning – these 9 European countries that take part in the Euro Milhoes – pool all of the money spent on EuroMilhoes tickets across Europe and this generally makes for exceptionally large EuroMilhoes jackpots which can be some of the largest in the world. These days the Euro Milhoes can also be played in Andorra, the Isle of Man, Liechtenstein and Monaco meaning that there are total of 13 participating nations. The Euro Milhoes Lottery uses what’s known as a double matrix of 5/50 and 2/12 which means that when you play EuroMilhoes – EuroMillions – you need to select 5 MAIN EuroMilhoes numbers out of a pool of balls from 1 to 50 and 2 LUCKY STAR numbers out of a pool of balls numbered from 1 to 12. Your aim when playing the game is to correctly match as many of the winning lottery numbers as you can – there are 13 different categories of EuroMilhoes prizes – if you match all 5 of the EuroMilhoes MAIN numbers plus the 2 LUCKY STAR numbers you will be the winner of the Euro Milhoes Jackpot. If you match the winning lottery numbers on any of the other 12 different prize levels you will win one of the many other great EuroMilhoes prizes on offer. A Jogar Rapido facility – also known as Lucky Dip or Quick Pick is available when playing the Euro Milhoes which means that you can ask your lottery ticket sales retailer or computer to select your lottery numbers for you – they will then do this using a simple, computer powered random number generator. You can play EuroMilhoes from anywhere – you do not have to be resident in Portugal or any of the other Euro Lottery participating countries. Many people play EuroMilhoes online these days quite simply because it is easier than having to go to a local retailer and buy Euro Milhoes tickets. There are various places that you can buy lottery tickets online safely from and it is recommended to only use those lottery ticket sales companies that have been fully authorized and are fully accredited when you play EuroMilhoes online. Our main recommendation for when you play Euro Milhoes online are companies such as TheLotter which has a long track record of proven years of good service. Other companies to use would be the WinTrillions – another lottery ticket sales agency which has been around for quite a few years now. More and more people today play Euro Milhoes online due to fact that they live abroad or because they like the ease and convenience that it provides. If you would like to increase chances of winning lottery games such as the Euro Milhoes this is quite possible to do – and you DON’T have to buy lots of EuroMilhoes tickets to do this. The best way to increase your chances of winning the Euro Milhoes is to join a EuroMillions Syndicate – EuroMilhoes Sindicato – this will give you a much greater chance of winning the lottery by having strength in numbers at the same time as sharing the cost. 1. Love My Lotto – A new Multi Lottery syndicate where you get from 16 to 80 entries into the EuroMillions and from 32 to 160 entries into the Millionaire Raffle every four weeks. As well as your EuroMillions entries you also get between 16 and 80 entries into the UK Lotto, between 8 and 28 entries into the £1 Million Daily Draw as well as between 16 and 80 entries into the UK Lotto Raffle draw every four weeks fully included and all at absolutely NO EXTRA COST. You may have seen the adverts on the TV in your area or in various national magazines and newspapers. Since its launch – YouPlayWePlay has seen new members join from well over 93 countries right around the world. These lottery syndicate options provide lottery players with a much greater advantage when they play EuroMillions – and give you improved odds of actually winning the lottery. 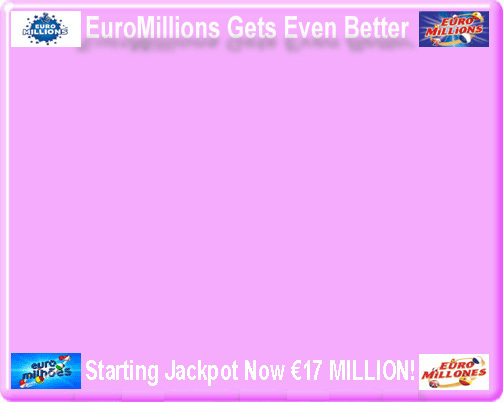 Where ever you see the names Euro Milhoes, EuroMilhoes, EuroMillones, Euro Millones, EuroMillionen, Euro Millionen, EuroMilliones or Euro Milliones remember that they all apply to the same game – the biggest European Lottery of all – the Euro Lotto.